Since Twitter has announced discontinuation of their TweetDeck client for Windows, it was clear that the world needed a hero. And a hero indeed came, and created a replacement which he called... TweetDick... Yep. If you're not a fan, try TweetDuck instead. Besides supporting most functionality of the discontinued client, TweetDick has seen several improvements over the official client, which makes it a pleasure to use and massively strengthens your friends' envy! Pop-up notifications now have a blue bar which indicates when the window is going to disappear, or display the next tweet in the queue! Moving your hand over to your mouse, and then moving the mouse over the notification stops the timer too, if you need more time to finish. It is now possible to precisely configure the pop-up notification location, and how long it will stay up! Don't worry - you can select Custom and move the window wherever you want, TweetDick will remember it. 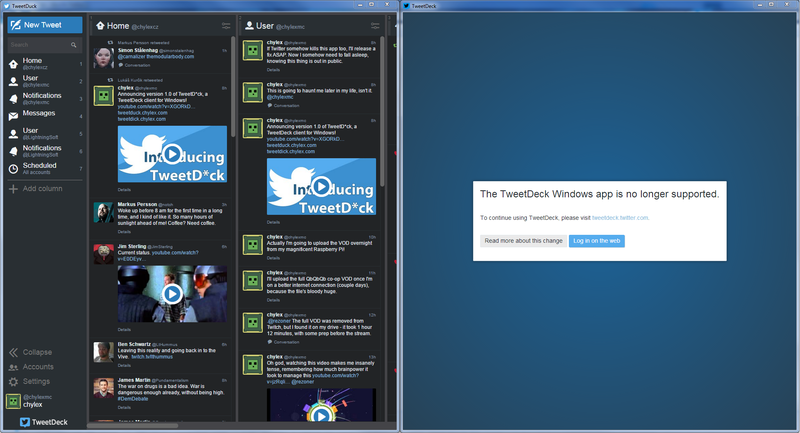 TweetDick is much more reliable and configurable for multi‑monitor setups! TweetDuck is constantly updated with small tweaks and enhancements that make your experience just so much better when compared to alternatives. Released under the MIT License, TweetDick is not only completely free, but also open source! TweetDick is no longer supported. Please, download TweetDuck instead. If you would like to show monetary appreciation for me doing the work a giant cockporation apparently could not, please consider donating via Patreon or PayPal (Cryobank donations coming soon). If you are unable to donate, please spread and tell your friends about TweetDick. TweetDick requires .NET Framework 4.5.2 or newer. It is primarily tested on Windows 7, but should work on all newer versions as well. The program requires at least 300 MB of free space on your drive, 512 MB of RAM, and a processor from about 2003. If you still have the official client installed and want to use the integrated migration, you will have to download an older version of TweetDuck to move your data and optionally obliterate the old installation. Please, make sure to update TweetDuck after the migration is finished. Before reporting an issue, please see the list of common problems and their solutions below. If the website appears malformed or you see black rectangles, please right-click anywhere in the window, select Settings, go to the Advanced tab, and disable Hardware Acceleration. This can affect performance, but the program should render correctly. First version of TweetDick went pubic on April 15, 2016. TweetDuck keeps getting updated with new features and bugfixes, so please share your ideas and feedback! Nope - here is a side-by-side comparison! If you want something a bit more sensible, check out TweetDuck.